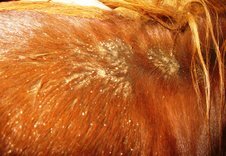 In horses, it is characterized by primary lesions that often begin on the head and lower extremities; secondary lesions spread to other areas, with an exudate that dries to a crust. There may be extensive edema (swelling) in the legs and abdomen (called "ventral" edema). Horses with EPF may also have systemic signs of illness - fever, depression, loss of appetite, lethargy and weight loss. The skin may be painful to touch and swelling can make it difficult to walk or lie down. Currently, treatment options are limited, mainly focused on corticosteroids (dexamethasone, prednisolone and prednisone) to limit inflammation; prognosis is generally guarded at best with many cases ending in euthanasia. Little is known about specific causes of EPF and what supportive treatments might be useful. The Equine Pemphigus Foliaceus (EPF) group is hoping to change this. Two horse owners who have been looking for information and answers have recently teamed up with Eleanor Kellon, VMD to look at triggers, what's working and what's not, and how these horses can be supported to continue leading productive, comfortable lives. Dr. Kellon has a long history of developing cutting edge science-based supportive therapies for horses, with an emphasis on precise diagnostics by field veterinarians. By identifying and bringing together owners of afflicted horses, reviewing and comparing their histories, diagnostics, treatment and outcomes, and utilizing available research, a comprehensive picture of how to optimize support will emerge. If you have a horse who has been diagnosed with EPF - currently or in the past - share your history with others by joining the EPF group. The group will provide information and support for owners, and is focused on improving science-based diagnostics, treatment protocols and outcomes for the horse.